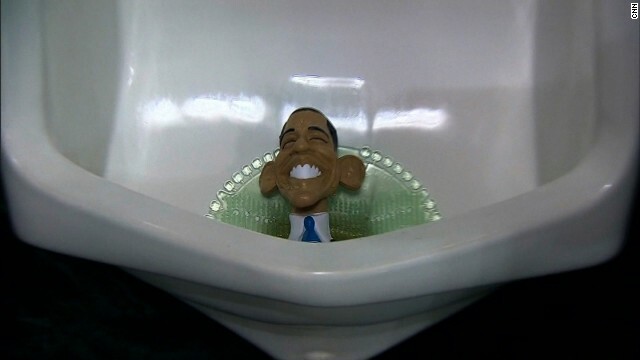 (CNN) - A cartoonish figure of President Obama was found in a urinal at a major conservative gathering in Washington on Friday. It's unknown who put the item there. One White House official responded with humor to an article about the foam figurine. "Totally uncalled for: Those ears are huge," Dan Pfeiffer, a senior Obama adviser, posted on Twitter. Event organizers did not offer a comment Friday afternoon. Our twice elected President shows that he has more self respect in one pinky than the rest of the teaklan/KKK/koch brother bunch of slimeballs. The more they hate on the man the more points he makes and the more votes the Democrats will receive in 2016. This is definitely not surprising coming from the party of hatred and bigotry. wow... i knew obama's poll numbers were in the toilet but i didn't think he was this far down the crapper! What is it with you and Chris e using URINALS to take a crap in? Eeeeeeeewwwwww – just asking is just nasty! After digging up a victim from 1975.... Who will they dig up next? Her preschool teacher to say she sometimes wet her pants??? This reeks of desperation on the part of the GOP. The party of family values never fails to disappoint. I'll be sure next time to imagine I'm doing my business into a TEApot. @ smith; My friend, what gives with you? We didn't always agree but I could at least count on you to stay above the hateful fray. I shouldn't have to remind you that their father was a community organizer. I don't know too many rich people that live in the communities that Obama was trying to organize. It stands to reason that these girls have been brought up with a heightened sense of social conscience and civic responsibility. It is therefore NOT unrealistic to have the Obamas continue to expose them to the fact of life by having them experience what it is like to work a minimum-wage job. @DM4O-My comment isn't a slam on the Obama family. Given the fact that the young ladies safety is huge matter and Im also 99% sure that both are excellent students I see both finishing high school and then off to college. Its a noble idea but they have nothing to prove and its not worth the risk to their safety or their education.